* And savor destroying the followers of Freyr in particular! 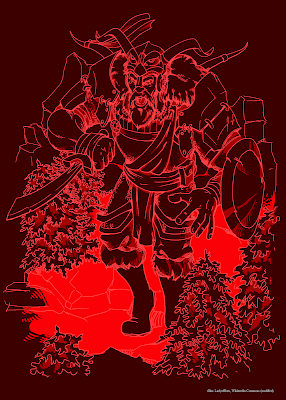 Special: Surtr is served by clerics and anti-paladins who are usually fire giants or at least have some fire giant blood. Mysteries of Surtr: Up to once per day per level, a cleric of Surtr can add 1d6 damage to his attack with his sword by engulfing it in fire. With scorching darkness and dreadful flame, the magic of Surtr burns all the same. Roll 1d12. 1. Immolation! The spell requires a living sacrifice by the stroke of midnight, slain by fire of course and having an HD equal to the spell’s level or more. If the victim is a type of being that the cleric can turn though, then only 1/2 the HD is needed. In any case, failure to provide one in time provokes Surtr’s wrath (via a divine test). 2. Scorch: Either the spell’s recipient (if beneficial) or the cleric (if not) takes 1d4 damage (from fire! ), though burning an item worth at least 1d6 gold pieces per spell level would do, even if it wouldn’t be as much fun to watch. 3. Burn Them All! 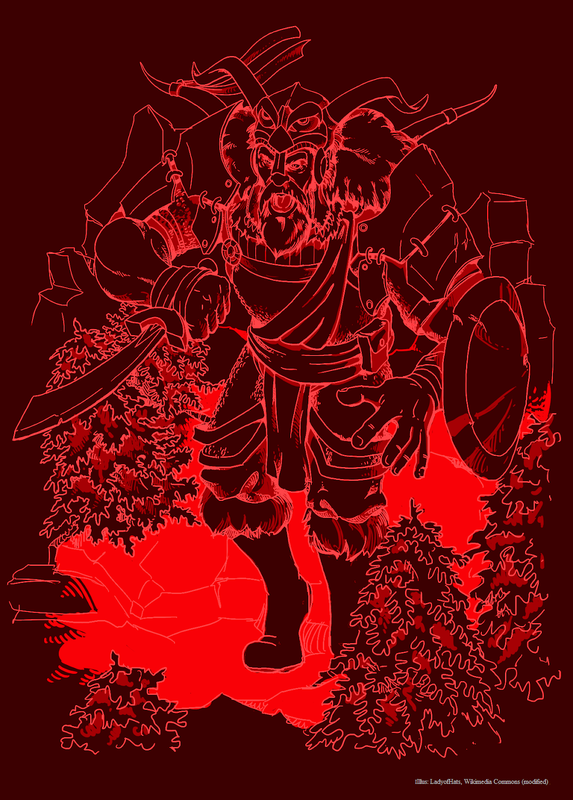 Surtr now takes a more direct interest in the spell’s target, burning them for 1d6 damage! They can save vs. breath weapon to avoid it, but then cannot reap any benefit from the spell. 4. By Smoke and Cinder: The cleric must be in a place of heat and/or darkness. Otherwise, the spell only has 50% of its usual power. 5. Scent of Muspelheim: The area within 120’ becomes more like Surtr’s realm, the plane of ash and conflagration. Due to the sweltering heat and blackness, all cold beings and those who enjoy light suffer a -1 penalty to all rolls while there. 6-8. Standard Magic: The spell works without side-effect this time. 9. Blackening Spell: The cleric turns charred and swarthy-smoky for the next hour, causing all non-Surtr followers to save vs. spell or flee in fear from him for 1d4 rounds. Still, the spell gains a 50% increase to its effect, range, or duration, so any friends he might lose as a result will be worth it. 10-11. Sign of the Eldjotnar: If fire is present or it is dark, then the cleric’s magic works with a 50% bonus to its effect, range, or duration. If both are there, then one can be doubled. 12. Devastation of Flame: Surtr is pleased and augments the spell for double its effect, range, or duration, as well as it not being expended that day. In addition, it grants a +1d6 fiery bonus to all of the cleric’s damage rolls for the next 1d3 turns. Next week: clerics of Surtr, Part II!